My attempts to write one post a week is a complete fail. Good news is if you subscribe to my blog then you'll get an email when I make a new post and only when I make a new post (this blog creating stuff is hard enough let alone figure out how to track and send emails to my subscribers). So, today's post is about Operation Poop Tank Installation. Two weeks ago, on a crisp Friday afternoon, Chip calls me to breathlessly share that we got our permit from the Health Department, he picked up the trailer, withdrew $3000 cash from the bank, put in a reservation to rent a track hoe, and was headed to the plumping store to buy the septic tank, 42 drainage field chambers and end caps, oh and was I ready to start digging tomorrow? Um...yes? My head was spinning! I went to work thinking "Yay, it's Friday! Then a 3 day weekend with a day-trip to Webster, FL to meet up with my parents and scour the Mondays-only flea market for treasures." Yeah - that was totally not happening anymore. However, we were going to be putting in the septic tank and drainage field - one step closer to building The Floridian! Saturday morning - we divide and conquer: I prepare lunches and head to Lowes with Bud Bud (Bandit) to pick up the plumping elbows, pipes, end caps and glue. Going to Lowes for things I know nothing about never really pans out well but this time I thought I had it, plus tons of extra (in truth, I bought 3 types of elbows and 3 types of caps and 2 different size glue canisters because I never know which is going to be the right one). In the end, the whole lot of parts was wrong - apparently some plumbing is pressurized (therefore thicker pvc material) and some is unpressurized. I bought the former when the latter was needed. Yikes! But it worked out as we didn't need these plumbing parts right away. So, back to dividing and conquering: While I was busy with my tasks, Chip was driving out to The Floridian to drop off the septic tank and drainage field materials, then we met back up and picked up the track hoe (also called a mini excavator) and finally to The Floridian, where we'd meet Chip's dad, to get to work. The next three days were spent digging, putting in the septic tank, setting up the drainage field chambers and connecting all the parts. Things went swimmingly until day 3 - I'll explain, just keep reading. 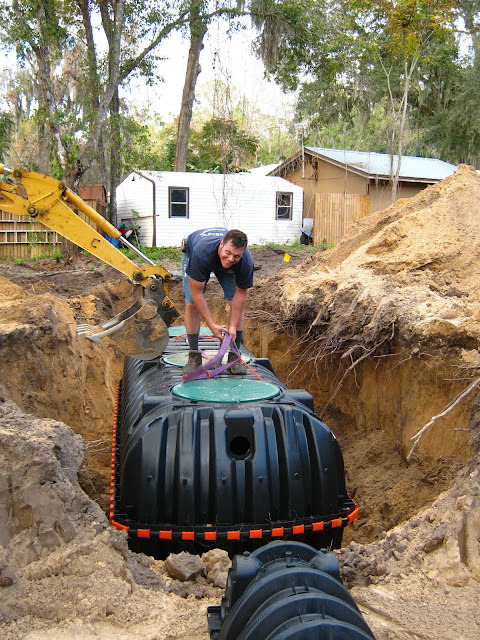 The Floridian's septic tank is practically the size of a tiny house. Okay, that's not a fact but it does help to visualize the size of this mammoth beast. Fact: The tank was 55" high and 15' long and weighs about 500lbs - that'll hold a lot of poop! A little more on the facts, septic tanks are made of cement, steel or plastic. The steel option wasn't considered because it's inferior to the others. The poly (plastic) tank costs about 200% more than a cement tank. However, when factoring in the amount and size of equipment needed to move each - and you're doing it yourself, the poly tank is a no brainer. The Floridian requires a 1350 gallon tank because there will be two kitchens (remember the studio above the garage has a kitchen). We purchased a 1530 gallon tank as that was the closest size available. A drainfield system can be set up in a trench or a bed format. The trench format requires less chambers (i.e. cheaper) but then there's more footprint (i.e. more land you can't do anything with except walk over). Chip went with the bed format as the length from the back of the house to the edge of the steep slope to the canal is limited to 45'. We figured the initial additional costs was worth the it knowing we'll have more opportunities to plant trees or a garden. With the bed format, The Floridian needed 56 chambers (4' long each) and 16 end caps. The cost: $4,012.84 for materials and equipment, with labor cost totaling $0. Chip talked with a local guy that rough estimated the cost to put in a 900 gallon tank (the size we originally thought was needed) at $10,000 and that price tag would have been higher with the 1530 gallon tank. 1. When leveling dirt for the correct height of the septic tank the dirt floor must be compact otherwise the weight of the tank, plus the additional weight of dirt covering the tank, will throw off the height. Dirt that's not compact is bad news bears. Why would it not be compact? Well, when the dozer and track hoe move the dirt - wait, let me pause here to say: we have beautiful dirt. A few of our neighbors and inspectors have commented about it...it makes me blush; I'm so proud. Good dirt means less issues. Back to the point, when this beautiful dirt is dug up it's as if sifted flour - it's fluffy and airy and each step you take your foot sinks down and your shoe is engulfed with dirt. I thought that walking over the dirt would make it compact, but I grossly miscalculated my impact versus the impact of thousands of pounds of tank and dirt. And...little did I know that Chip and his dad knew the ground needed to be compact - if they were hired workers I would have felt shimmy-shammed. Chip and Manuel thought it would be fine, but on day 3 (the tank was placed and covered with a bit of dirt on day 2) we notice the tank was lower than the previous day, and therefore, the tank's output was lower than the intake drainage field chamber - which means water will not flow out of the tank. Now, more money and time were required. Fortunately, Manuel has a machine specifically for making dirt compact, called a Tamper. Chip and his dad spent the next day preparing (the tamper needed a new engine and some welding work) and the following day getting the septic tank leveled correctly. 2. We didn't pass our first inspection because of the drainfield. The good news was the septic tank was fine (thank goodness). The Health Department inspector, Ed, assumed we'd use the trench format as it's most commonly used and Chip didn't check the Florida codes to know the requirements differ for the two formats (he has since spent time at the library researching Florida's building codes for The Floridian). Chip and Ed talked and brainstormed ideas. The result was to widen the bed about 2' on the south and west sides and add more chambers. The remainder of the day, Chip set back to work digging and leveling until dark and I ran to the plumbing store after work to purchase more materials (my 3 days on the job proved successful training and acquisition of materials needed) - and the next day we were back at The Floridian to finish digging and set up the remaining chambers. Upon our second inspection, Ed gave us the green light. Operation Poop Tank Installation was complete! What a cool post! Most think of building a house, this part was less about the house and more about the things to worry about that most don't ever think of! It's amazing that you guys have all these tools. Looks like a well spent weekend! I can't wait to visit and see how things are going!! Wow that really was some job you guys had to do. Interesting story. Thanks for sharing. I remember my guys at http://malabanansiphoning.com.ph/.